Got heavy grease stains on your clothes? 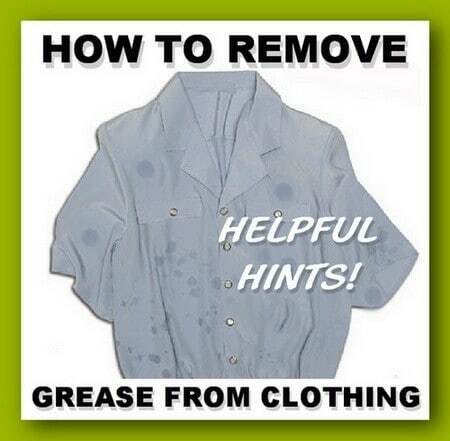 Here is how to get the grease out of clothing! We have multiple solutions for you to try that are proven to work. Try them all and use the one that works best for you. Whether it’s automotive grease or cooking grease, our methods will remove them all. We try to give you tips to use non-toxic cleaning products. Some of the products we mention may not be considered a natural cleaning product. The methods below have been proven to work many times over at removing grease and oil stains on any clothing. 1 – Dampen the stained area with water and shake some baking soda on the grease stain. Leave it on the clothing overnight. After time has passed, wash the clothing in warm water with your normal detergent. This works every time. If the stain is still visible after washing, do the same thing over again. This process removes very heavy grease stained clothing without using harmful chemicals. 2 – Heavy food grease stains can come out of clothing if they are soaked in heavy duty detergent for a few hours first. Liquid Tide and ALL will do a great job in this area. You can also rub liquid Tide right on the grease spot and let sit for awhile before washing. Sometimes the heat sets stains so use medium warm water when washing. If the stain is still visible before putting it in the dryer, it is best to line dry the clothing. 3 – Ammonia works well to cut grease too. You can use it to remove thick heavy grease stains from clothing. Surprisingly, it is a great grease cutter in combination with some detergents. Be careful of fumes when using ammonia as they can be harsh. You can also use Borax as it can cut grease too. 4 – Dawn dish detergent works great in very small amounts. Dawn is a very powerful grease cutter obviously made to clean dishes but works on any type of grease or oil. Use just a few drops and drip it on the grease stains and rub the soap into the stain. Do not use too much Dawn detergent as it makes lots of suds and it may damage your washer. To remove the heaviest grease stains, saturate the oil spots with Dawn Platinum dish detergent. Let it sit for 2 to 3 hours so the Dawn soap can penetrate the stain and get into the fabric. Next, wash on the warmest setting allowed for that particular garment. 5 – One of the best products to remove oil and grease is Lestoil. Lestoil is available in grocery stores, Amazon, and in hardware stores. Using a small brush (an old toothbrush works great), apply the Lestoil directly to the spot and let it soak in. Rub a little more of the product into the oily stain using your brush once again before putting it in the washer. Add the clothing into the washer on the longest wash cycle possible and the grease spots will be gone. 6 – Adding baby powder on the grease stain works too. Get the baby powder wet after adding it on the stain and let it sit on the grease spot for 24 hours. At this point you can then spray some Shout stain spray or something similar on the stain for extra measure. Wash the oily greasy clothing in cold water and dry on the gentle cycle. HINT/TIP: If the grease spot is on a white shirt, you can use a Mr Clean Bleach Pen to help to remove the stain completely. 7 – Automotive degreaser works too. Get the degreaser from your automotive store. This type of product will dissolve all grease and oil if you soak the clothes first and then wash them in the washer on a warm or hot setting. You do not need to use much of the automotive degreaser when soaking your clothing. Usually these types of products are concentrated and not much is needed. Read the labeling to find out. If after using any method above your clothing is still stained, try another product listed above and wash and dry your clothing another time. Usually if this is a tough grease stain, washing the clothing twice may be needed. Spray the spot with WD-40, the grease will vanish before your eyes, then hang out to air out, before washing, or your washer can explode due to fumes. Use outside only! Previous post: How Do Pilots Communicate With Air Traffic Control?